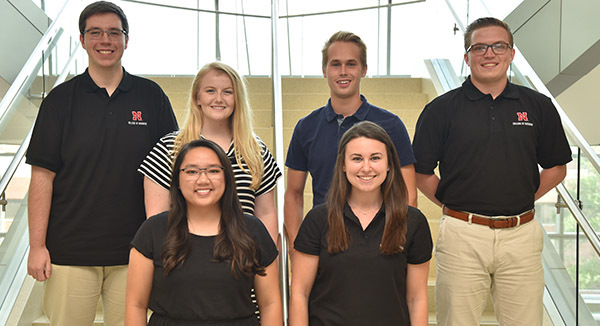 Peer Career Coaches (first row l-r): Holly Pham and Sarah McCormick; (second row l-r): Wyatt Packard, Allison Norton, Justin Wiebelhaus and Hunter Kelley. The inaugural group of peer career coaches were selected and trained for the 2018-19 academic year. Peer career coaches are: Hunter Kelley, senior international business and management major from Lincoln, Nebraska; Sarah McCormick, junior management major from Chicago; Allison Norton, junior accounting major from Omaha, Nebraska; Wyatt Packard, senior management major from Lincoln; Holly Pham, senior business administration major from Lincoln; and Justin Wiebelhaus, junior finance major from Omaha. They are trained how to effectively coach and mentor their peers throughout the career development process and will assist in coaching students taking Career Development and Planning (BSAD 222) and Internship and Job Search Strategies (BSAD 333) courses in the college’s Professional Enhancement Program. Dr. Yijia Lin, N.Z. Snell Life Insurance Professor and professor of finance, has been appointed co-editor of the North American Actuarial Journal. With this appointment, she now serves as co-editor of the two leading journals in the field of risk management and insurance. Rob Simon, associate professor of practice in marketing, and Dr. Eric Thompson, director of the Business Bureau of Research and Karl H. Nelson Associate Professor of Economics, were interviewed for an August 9 NET News story on Facebook Marketplace and local buy/sell/trade groups on Facebook becoming more popular. Read more at: http://netnebraska.org/article/news/1140048/digital-thrift-store-facebook-marketplace-new-corner-boutique.